This entry was posted in Awards and tagged Keith Kato, Robert Heinlein, The Heinlein Society by Mike Glyer. Bookmark the permalink. 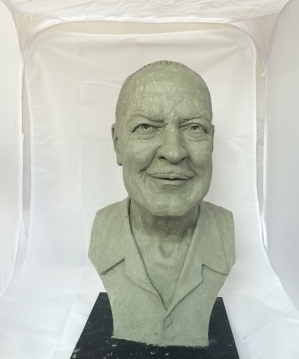 I would never have recognized that statue as Heinlein. Oh, dear. That’s rather ugly, isn’t it? And I’m with Rich, I would not have recognized it as Heinlein. It’s weirdly messy, and I always think of him looking very neat and spare. That is strange that they are only doing this now. He was selected for the Hall of Fame in 2013. This is certainly not the RAH I knew and dealt with 40 years ago for the first MidAmeriCon in 1976. This is one unattractive bust, even as these things go! Take a look at his photos on Google Images and judge for yourself. Keith Stokes: They only induct after somebody has paid to have the bust and installation made. The state doesn’t foot any of the bill. Was there some kind of miscommunication with the artist so he thought he was doing a caricature? At least when Gahan Wilson made the HPL bust, he was deliberately doing a grotesque caricature. This is horrible. The head’s too big, and the expression is ew. It’s like a fish-eye lens effect. @Lydy: Yes! The man was Navy. Literally ship-shape. I just checked Google Images to confirm. That man was dapper.